I, like you, am a car enthusiast. The difference is that while you surely have some sort of exciting rear-wheel drive sports car, I have a Nissan Cube, which is the world’s only car with dashboard-mounted shag carpeting. Despite Cube ownership, I still get to enjoy the perks of being a car enthusiast. This primarily consists of being able to tell the difference between an unmarked police car and an old person driving slowly. Also, I can always pick out an Infiniti G35 based on its engine note, which is highly impressive to anyone nearby, provided they aren’t female. I’ve learned over the years that telling people you can’t diagnose a problem from a “funny noise” leads to the retort: “I thought you knew everything about cars.” So I now explain that because they have an Audi, it will be around $1,500. After several years of Audi ownership, I’m quite sure this is the same pricing strategy the dealer uses. But the “funny noise” question is nothing compared to the most dreaded words a car enthusiast can hear. No, I’m not talking about “I saw you racing,” as stated by a state trooper at 1 am on the highway shoulder. I am instead referring to the much, much worse: “What car should I get?" I, probably like you, am asked by friends for car recommendations on a constant basis. So I, probably like you, provide earnest, helpful advice listing several reliable, practical cars that fit within the friend’s parameters. I, probably like you, explain the pros and cons and give the friend my thoughts on each car’s driving experience. And then, I, probably like you, am completely ignored while the friend buys a Volkswagen Beetle Cabriolet. Truly: this happens all the time. So frequently, in fact, that I now have a standard reply when people ask me for car advice, which is: “You know I have a Nissan Cube, right?” This is a great deterrent. It usually stops people from asking my advice on cars, or restaurants, or hotels, or, in some cases, from talking to me at all, which gives me far more time to sit on my porch and nap in an ongoing effort to write these articles. 1. People who have already made their decision. I believe that at least half of people who contact me have already made their car decision and simply want me, a bona fide car expert who once crashed a Panamera, to reinforce it. Me: I think a base Mini Cooper with 90,000 miles, a rebuilt title, and an automatic transmission probably isn’t the best decision. Car Advice Asker: Well I found a Car & Driver from 2004 that says it’s really amazing, so I’m going to go with that. Me: Good idea. Did I mention I have a Nissan Cube? I’ve discovered that you’re only an expert if you agree with peoples’ pre-conceived notions. For example: telling a baby boomer that American cars are reliable has approximately the same effect as announcing that you were recently abducted by aliens and released only after providing a detailed, hand-drawn roadmap of the greater Houston area. 3. People who have more money than they say. If you’ve ever tried to provide car advice to someone under 25, you’ve encountered this. It usually starts when I’m approached by someone who has a $2,000 budget for a car. This results in me giving detailed advice like: for God’s sake, make sure it includes a steering wheel. Actually, in these cases, I usually visit Craigslist and search for listings I think will be especially helpful. I point out common trouble spots. I mention things to stay away from. And then I discover, three months later, that the person is driving a brand-new Prius. The reason: once parents realize the kind of crap that’s available on their kid’s $2,000 budget, they usually step in with lots of a) cash, and b) pre-conceived notions. This, I believe, is how Toyota remains in the car business. Of course, occasionally, someone actually does follow my advice. My brother, for example, bought a Nissan Cube on my recommendation two years ago. But he quickly grew to hate it, which is why I’m driving it now. In other words: maybe I’m not such an expert after all. 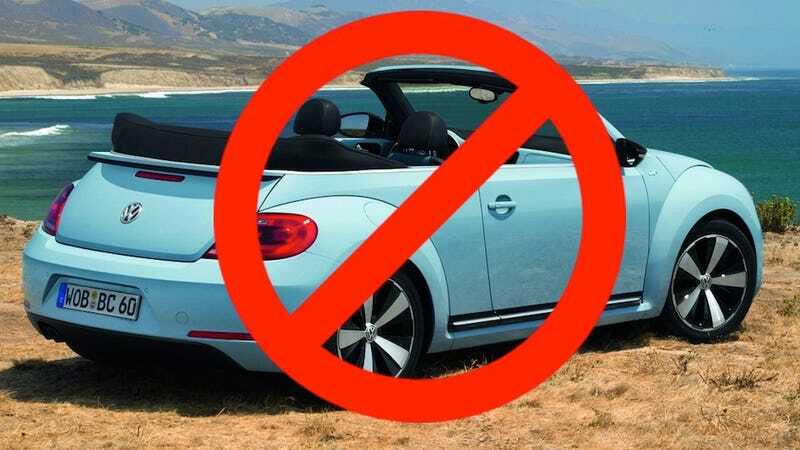 If only that would stop my friends from calling me when their Beetle Cabriolet is making a funny noise.